It's a story about two boys Ryan & Matthew. One day they woke up on a mysterious island with no clue how they got there. They have no food, water or shelter to hide. But they have to survive and find a way to escape from the creepy island. Ryan had a dark complexion, was already six feet three inches tall and had dark wavy hair that he let grow out. He was always messing with it to make sure everything was in place & looking good for the girls who seemed to naturally be attracted to him. Matthew, on the other hand, hadn't quite hit his full height yet & was trailing around six foot tall with blond hair, fair skin & lots of freckles, which made him always appear younger. He kept his hair short & didn't care to deal with combing it unless he absolutely had to clean himself up. Matthew was more interested in hanging out with his best friend but Ryan interested in what the girls liked or didn't like. Ryan had always been the goofy one & Matthew the practical one & it was proving to be a perfect combination on this journey they were on. Each time they completed a challenge together using teamwork, they were rewarded with food & water and other supplies to survive. They fought with a beast, river monster, fall from cliff & many other adventures they had on their journey. They were far away from their home but they had each other till the end. It was generally Matthew who had little patience for Ryan, but slowly the roles were reversed. They were supporting & understand each other very well. "I am the eye of the storm; I can stay calm & centered regardless of anything." The island games they had been playing since they arrived on the shore of the island were a true mystery. The boys recalled the four different areas they had now been in on the island - the jungle, prairie, desert and the highlands & find different keys. But the volcano had been their consistent landmark throughout the journey they were on and were amazed at themselves as they remembered the crazy challenges they had overcome. The boys thought about the game they were being forced to play. They realize it's not really about what life throws your way because bad things can happen and, oftentimes, to really good people. It's really about how you face those challenges. 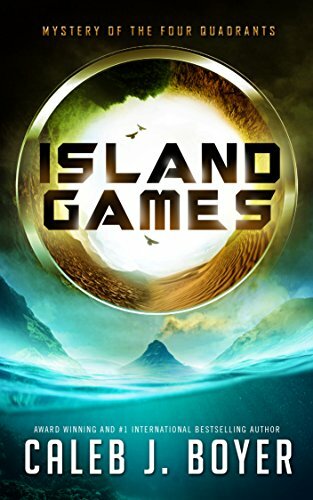 As the boys continued to reflect on the island games & their past, their memories were starting to come back stronger now, & they had finally reached the point of agreement that they were happier than they had ever been, even though none of this made any sense. "A warrior acts in spite of fear and is willing to do whatever it takes, even if it's hard. A warrior is bigger than any obstacle and never gives up." The story is fast-paced but I don't like the way the story end or some dialogue between the main characters. The story is based on the imagination of the 12-year-old author. The author tried very well but I believe he can do better. I recommend this book to children only. Caleb J. Boyer was born in Fargo, North Dakota. He lives in Moorhead, Minnesota with his family. His passion for books grew to the point where he started creating his own stories. 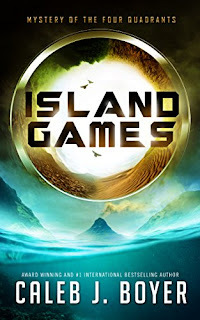 At twelve years old, he wrote his first book, Island Games, an adventure story. He is an Award winning #1 International Bestselling Author. He has been featured on ABC, NBC, CBS, FOX, and in Times Square. Caleb founded Read-Write, LLC, a company dedicated to instilling youth around the world with a passion for reading, writing, and entrepreneurship. He learned through life circumstances and find the strength to support, and be supported by, others. "Focus on what you want & not on what you don't want; create clear intentions commit to them."